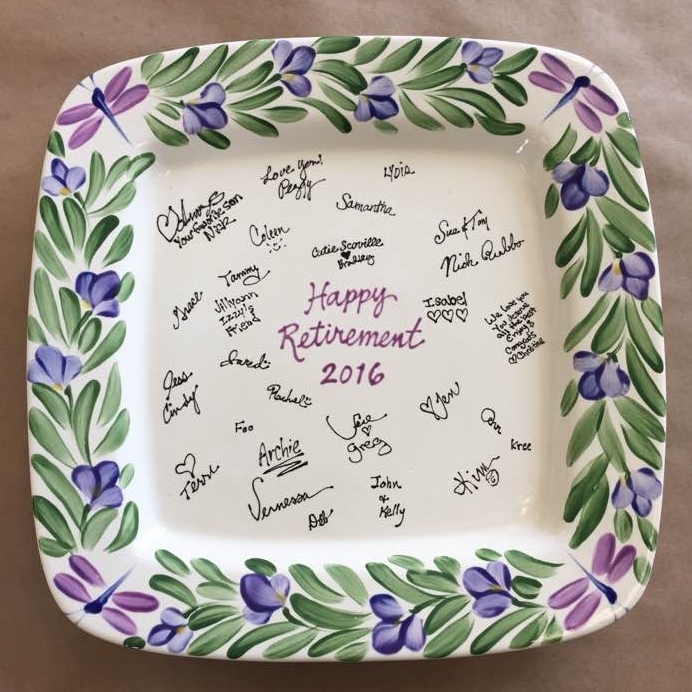 One of our most popular creations are custom designed signature platters for weddings, birthdays, showers, retirements and anniversary gifts. You take the unfinished piece to the event, have the guests sign it with a Bic brand ball point pen (black or blue ink), then bring it back to us and we do the rest! 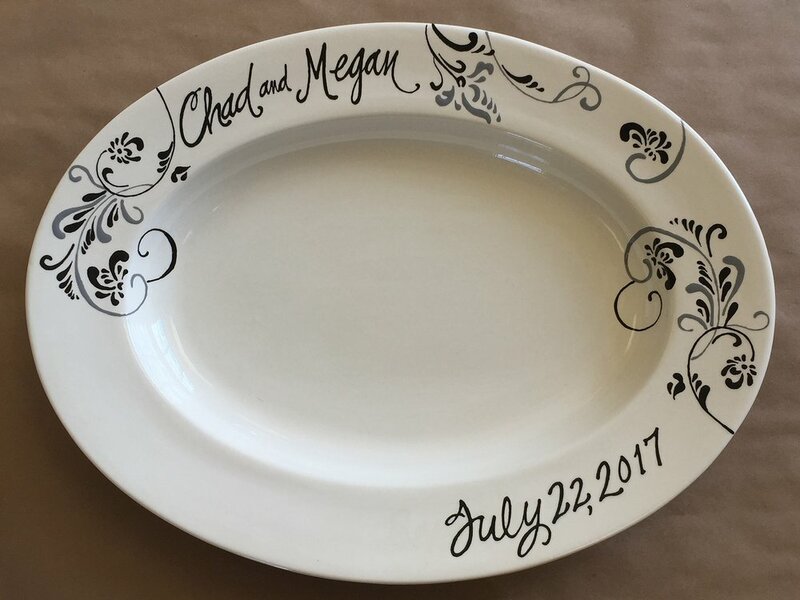 We will copy over all the guest signatures with ceramic glaze and decorate a custom designed border as well as the name and date of recipient(s). The signatures and design become permanently embedded into the pottery piece during the firing process. If you have your own design idea that you would like to have created, we can accommodate your request. Please call our studio for pricing information. Pieces are generally finished within 2-4 weeks of the order. Rush orders are available for an additional fee and can be finished in as little as seven days. These pieces are fully food safe and functional and signatures are forever permanent. They truly make great one of a kind gifts that will be treasured! Please contact us if you are interested in designing a signature platter for your event. Additional shapes are available. 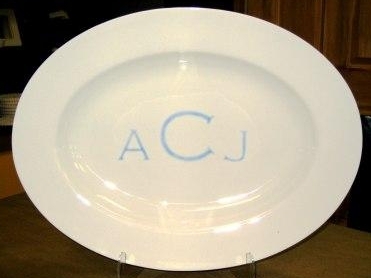 Please contact the studio and we can help you find a platter shape and size that will accommodate your needs. Available in 3 sizes: 11 inches (Small), 14 inches (Medium), and 16 inches (Large). Available in two sizes: 10 inches (Small) and 14 inches (Large). Available in two sizes: 15 inches x 11 inches (Medium) and 18 inches x 14 inches (Large). Available in two sizes: 11 inches (Small) and 13 inches (Medium). Available in one size: 18 inches x 14 inches (Large). Available in one size: 18 inches (Extra Large). Available in one size: 16 inches x 14 inches (Large). Available in two sizes: 11 inches x 8 inches (Small) and 14 inches x 10 inches (Medium). Available in one size: 15 inches x 8 inches (Medium). 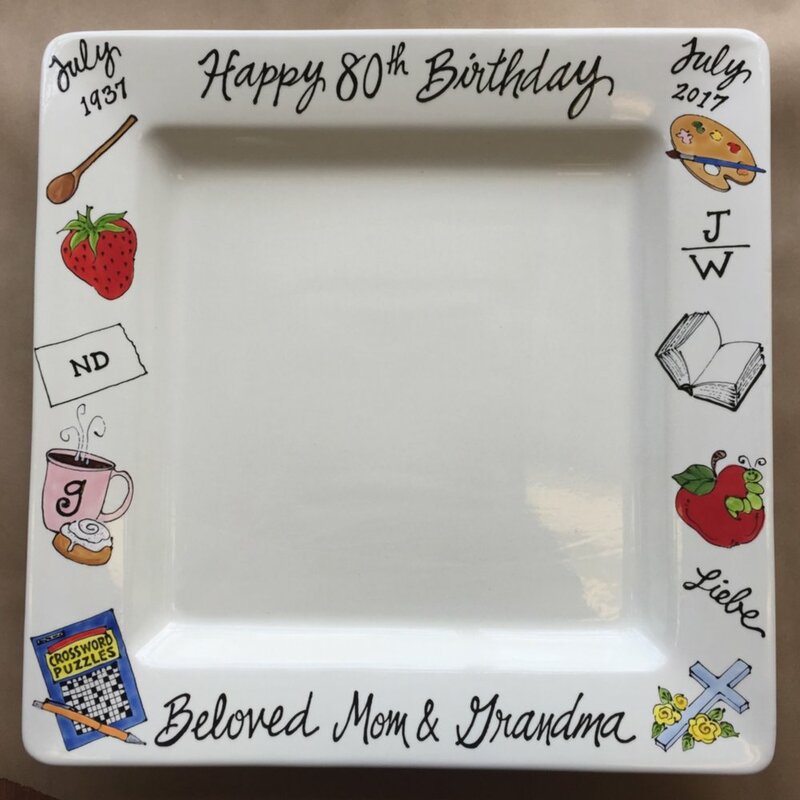 For those wishing to present a finished gift at the reception, you can have a blank signature platter custom painted with your design, name(s), and date. We will glaze, fire, and ship it to you finished or you may pick it up at the studio. 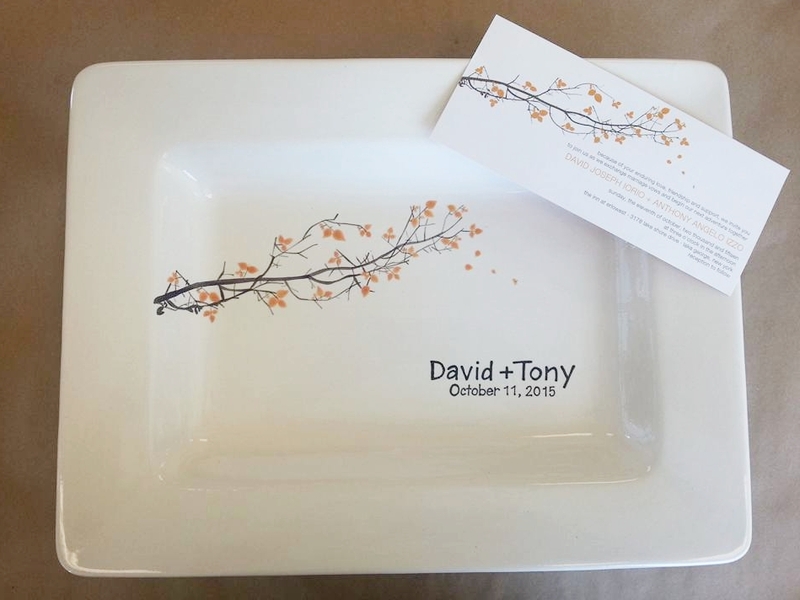 We include a special fine tip porcelain marker (with instructions) for your guests to sign with and then you bake the platter in your home oven to bond the signatures to your platter. 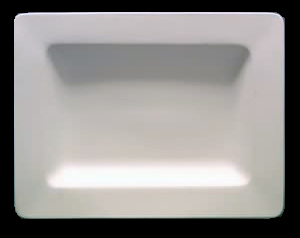 The baked signatures are resistant to hand washing with mild soap and water. To elongate the life of the signatures, we recommend you limit food use to dry foods (non-liquids) wherever the baked-on signatures are present. 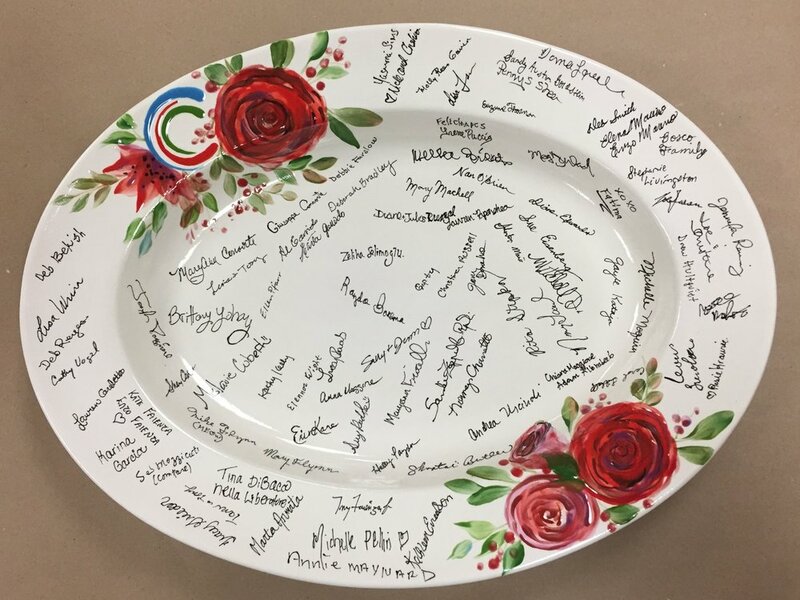 Pre-Finished Guestbook Signature Platter being signed at the event.